Twisting Mike's arm with a threat to file a law suit which would cost her beans, Lucky manages to get some money out of Mike. But of course, he specifies that he is unable to pay her all at once attributing this to business cycles. This has been echoed by Bikram Choudhury the great Yoga Guru of Bikram Yoga who while endorsing my book has shared the wisdom of his own guru who said " When you go through bad times - don't cry because good times are coming soon. Life is like waves in the ocean: one up, one down and two up and two down create two up." Mike set the glass down and smacked his lips. Even though my grandmother forbade cards at home ( or perhaps because she did) I loved playing cards with my friends - especially on days when it was raining hard and it was impossible to go out. Of course in those days we didn't play Poker but - the childhood game of Bluff. I remember one particular rainy afternoon when the children were also getting bored, I suggested we all play Bluff. Immediately, my older boy rushed to the drawer where he had secretly hidden the cards. Half way through the game when I saw my younger boy's pile of cards growing higher and higher as he tried bravely to keep away the tears that threatened to spill......... I decided to come to his rescue. Since I had long since finished my cards and was technically out of the game, I took his side and quietly whispered in his ear : 5 Tens. The little one was shocked. He looked up and said 'But mom, that's a lie. And you said you should never tell a lie." While looking out for Mike Lockwood's office in New York, Lucky comes across a used syringe. Hardly an auspicious omen, she thought ( P.131). Lucky is not the only one who looks out for signs that portend good or evil. Even the most rational of us tend to believe in superstitions especially when we are stepping out for that special deal to happen. For instance, I have a particular superstition : whenever I see Mr. Shroff step into the elevator, I know for a fact that my day will go wrong or whatever it was that I set out to do won't get done. I tried not blaming him for my mishaps but was it coincidence that the first time I saw him my flight was cancelled, the second time I saw him my son missed his first prize at the competition we were going to? I can go on and on about how Mr. Shroff is my albatross - or perhaps it is just God's sign that things will not go well and I should thank Mr. Shroff for warning me in advance. Of course there are good signs too! For instance when my hand itches, I almost always get some money and whenever I hear Cliff Richard's song "Congratulations" playing on the radio ( which is very, very rare these days!!!) I know I am going to really get lucky! 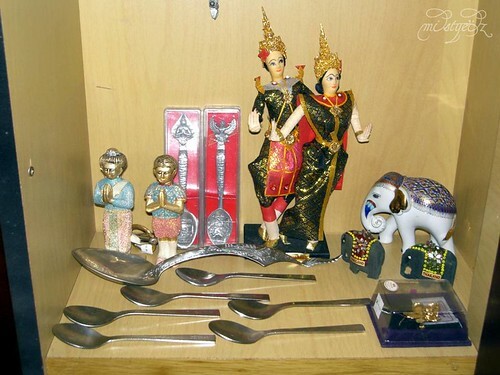 It has been a tradition among travelers to bring home mementos of their trips abroad. So many people feel it is imperative to bring back bric a brac , handicrafts, souvenirs or giveaways for their friends and relatives back home. Most common are of course mugs or tee shirts proclaiming " I was in......" or" I Love......"
Sometimes these quirky reminders of their holidays which reflect their own interests are well well crafted traditional handicrafts but one has to choose carefully because it is quite easy to cross the line from art to crass. What kind of mementos do you bring home? Like most Yoga teachers Lucky uses props to make sure that the pose can be held for a longer time and she tries her best to convince Warden Capps that belts were essential to Yoga practice. Naturally, being a potential weapon, the use of belts is denied and Lucky wonders how she can go ahead with the class. Nowadays, with all the props floating around : belts, bricks, chairs, benches, ropes, sticky mats, bolsters,blankets, wedges, bars, and a list getting longer by the day, yoga class is almost beginning to resemble a workshop of sadists with people stretched out over back benches, or people in sarvangasan with hips resting on chair seats with arms clenched tight to the chair legs, bodies contorted in impossible twists made possible with belts and of course the good old shirsana practitioners who hang upside down on ropes! Honestly,I miss those good old days when all that was required was a plain old towel. A towel which doubled up as a mat for the head and shoulder stands and supported knees in a camel pose, or a roll under the knees for a virasan and finally spread out into a carpet for the shavasan. While all the asanas or poses are basically the same, there are various schools of Yoga practice. Yoga class seems simple especially when you are on the sidelines watching. Over the years, I have been to several yoga classes beginning with the simple gentle ones and gradually going on to more vigorous, dynamic yoga. 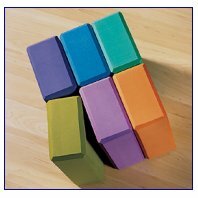 I can never forget my first class ever at the Iyengar school. Bright and early, I went inside the class which was waiting for the teacher to arrive. There was pin drop silence and all the students were busy doing some pose or the other. Some of them were sitting in a meditative pose, others were lying down in the corpse pose, a few were standing on their heads, while yet some more were hanging upside down like lemurs from the ropes suspended on the walls. I was quite intimidated by their proficiency! Despite my years of practice, I seemed like a novice. After the class began, I realised that the method of instruction in this class was simply to observe the person in front of you and get into the pose. Then, our master, Kobad, would come around randomly and either correct the errant pupil or praise someone's exceptional pose. I quite liked this system and I was enjoying the class, till I saw him approach me from the corner of my eye. My heart began to pound . What would he do? Would he yank my arm into position, kick my leg back or simply praise me for my perfect pose? I found out soon enough. He grabbed my upper arm and began kneading it while he yelled gleefully to the class : "Look at this butter ball - a perfect example of Porbandar's Pure Ghee!" While the class snickered, I died a hundred deaths and tried hard to keep the pose without burning up in embarrassment. This magnificent building in New Delhi, houses the Indian Parliament which consists of the Representatives of the people ( Lok Sabha or Lower House) and the Council of States ( Upper house). Our Parliamentary system draws heavily from the Westminster model but our representatives' behaviour is often far from Parliamentary. We actually have a TV channel that broadcasts live the proceedings of Parliament. Sometimes, when I am bored with the mundane stuff I see on television, I watch the Parliamentary proceedings - I am amazed at the stuff our MP's come out with. During one session last year, there was actually a group of MPs who brought along a sack and took out huge sums of money claiming that these sums were used to buy votes!!! In yet another session, the representatives actually got violent and threw around tables and chairs. Is this freedom of speech or sheer boorishness? Sensing Lucky's hesitation in accepting her theory of renouncing all desires for the material world, Shanti shares her tragic personal story where she lost all that was dearest to her. The Indian freedom struggle, like all social and political revolutions demanded a price. It may sound harsh, but it is nature's law : every new morning comes after the darkness of night, however dark it may be. Is Lucky the original Material Girl? We are not human beings undergoing a spiritual experience but spiritual beings undergoing a human experience. Let go of the material world. Let go of these illusions. It's then that you will attain the wisdom of the sages" ( Pgs.120-121). After all, if it weren't for human desires and aspirations there would be no motivation to work would there? Everything that you do will come back to you. It sounded like cosmic revenge (p118). "According to the laws of karma, we reap what we sow in this or in another of our past lives. In other words eventually the books must balance." Lucky is not alone in this world wondering how some people literally get away with murder. One such person who comes to mind is Hitler who got away with the holocaust , killing thousands of innocents in cold blood, destroying millions of lives and yet getting away with a cyanide pill. In the face of such instances from history, I wonder how the theory of karma fits in. However, on a lighter note, I'd like to share a joke I got in the mail about life completing a full circle. At age 17 success is . . having a driver licence. At age 70 success is . .. . having a driver licence. At age 80 success is . .. . not piddling in your pants. Modern day students of English will find it strange that we actually had to learn the basics of the language brick by brick. Starting out with simple verbs and nouns we graduated to adjectives and adverbs, learning to parse each sentence into subject object and predicate etc.etc. In the course of this education, we also had to learn figures of speech, phrases, idioms, metaphors and proverbs. So thorough was this grounding that there are some idioms that remained indelible, one of them being "Ships that pass at night", signifying two strangers that meet in passing, acknowledging one another by a sign , never to meet again. But are Shanti and Lucky ships that pass at night? Or do they have more interactions? It is amazing how the Lord opens a window when one door shuts. At the depths of despair, Lucky is at her wits end when she meets Shanti, the person who not only offers her comfort but helps her rebuild her life with her wisdom. All of us need mentors , an older person whose experience we can draw from. The original "Mentor" was a form that Athena took to counsel Penelope's son during the Trojan war encouraging him to go out and find out what happened to his father Odysseus. Shanti's device reminds me of the step counter that was gifted to me several years ago.It was a step counter which you are supposed to hook onto your trouser belt . This then proceeds to count the steps that you've taken the whole day, the target being 10,000 steps every day. Walking a 10,000 steps doesn't seem too hard does it? After all, if you answer the door bell, you have to walk, if you need to get water from the fridge , you have to walk, so on and so forth. I happily hooked it on to my belt and began the day. I tried hard to resist peeking at the counter but made an extra effort to walk more than I normally did. After lunch, when I cleared the table and walked to the kitchen sink with them ( something I normally never do!) to have those extra stepts registered on the counter, I couldn't help but have a look. I was amazed to find that I had only done 1,000 steps!!! I took off the counter in disgust and decided to only use it to count the steps when I walked round the Race Course. The next evening, I put on the counter as soon as I reached the Race Course and briskly did my two rounds. Once again, I looked at the counter and was sadly disappointed to find that I was 3000 steps short of the required 10,000 mark. Never mind, I thought, I should increase my rounds to two more and that should meet my goal. I re-set the counter to zero and kept the counter in my bag. When I took it out of the bag to keep in my cupboard, I realised that the counter had moved! I shook it and found that it moved even more! So that's how the steps were counted and I could easily get to 10,000 steps without moving one foot in front of the other but just shaking the counter in my hand! On P114. Lucky climbed up the staircase to the top of Malabar Hill. She paused in the shade of the Pipal tree to watch a small, brightly coloured bird perched on a limb. The bird was tiny like a sparrow, brown with a long orange beak, a splash of white on its chest and bright blue and black markings on its wings. Despite being a truly urban space, Mumbai used to have a substantial bird population. Malabar Hill was in fact home to several exotic Indian Peacocks that would come flying into the gardens of nearby homes , dancing merrily in the misty drizzle . A few years ago, though, flycatchers and sparrows almost disappeared from Mumbai's skies and the only birds we could see were the ugly House Crow. This fall in small bird population was not due to the depleting green cover as one would imagine, but strangely enough attributable to the microwaves in the sky! It seems that these poor birds had not yet figured how to avoid these waves and were literally falling out of the sky, stunned to death. Of course, I can't vouch for the veracity of this fact but this was the reason given by ornithologists. Since then, the number of mobile operators in this city have not diminished but the bird population has increased. Perhaps the sparrows have learnt to dodge the waves after all! Lucky's nightmare seems to get worse on P.109-110 where she meets with Dr. Das Gupta the family physician . 'I'm really sorry...You cannot have children." Being told that she couldn't have children was a big blow to Lucky yet somehow While she manages to gather her wits about her and suggested some treatment. Unfortunately for her, even that option was not possible because she actually was deemed sterile. Every woman can empathise with Lucky because motherhood is almost a given . Yet, it is amazing to know that though our population numbers are going through the roof, one in four couples has problems in conceiving. 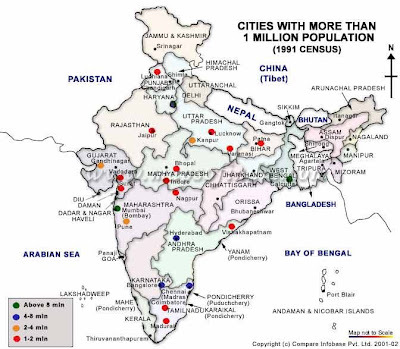 In this map reproduced below there are over 20 Indian cities with a population of over a million according to the 1991 census. I am sure there are more cities joining the millionaire club today!